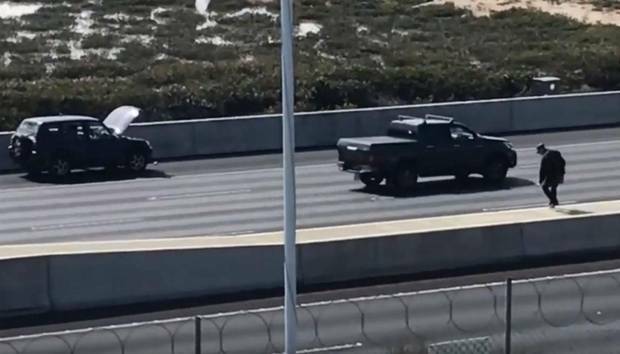 Footage of a man making a mad dash across a busy Auckland motorway after running out of fuel has been uploaded to Facebook. The man can be seen in the footage holding a fuel can while trying to dodge motorway traffic. The incident was filmed on Tuesday by Brendon Verryt, who then uploaded the footage to Facebook. Verryt was working in a nearby office when he saw the man on the Northwestern Motorway, in Auckland, near the Patiki Rd offramp. "Run out of gas on the motorway? No worries, just run across eight lanes of speeding traffic, pick up some gas and head back, easy," Verryt wrote on Facebook. Verryt said the man had his wife and kids in the car when he did the mad dash across the motorway to the nearby petrol station. "He was so casual about the whole thing, just strolling across the motorway," he told the Herald.